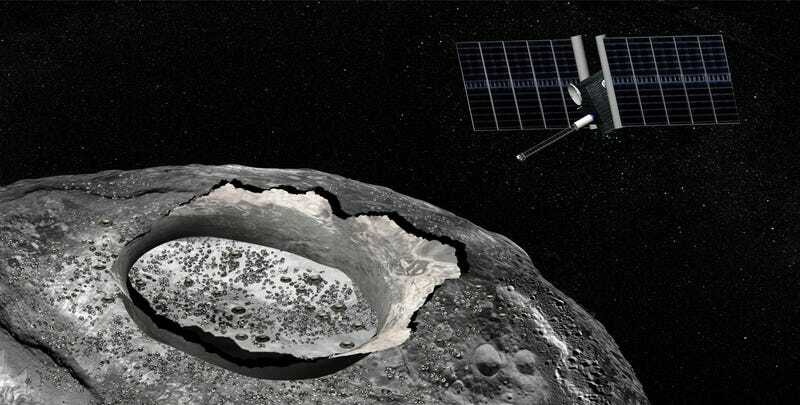 NASA announced the finalists for its next round of planetary explorations. There were the usual suspects—Venus, Jupiter’s asteroids—and, then, there was this: An asteroid, composed almost entirely of (possibly magnetic) metal, with a crust literally beaten away by interstellar collisions, named Psyche. Pardon? If you haven’t heard much about Psyche yet, there’s a good reason: We don’t know very much about it. But the things we do know are, in a word, bizarre—starting with where it came from. Psyche is exceptional for being a very large asteroid to begin with, but it also has another distinction: It’s made almost completely of metal, mostly iron. But Lindy Elkins-Tanton, who would be leading the mission, and other researchers don’t think that was always the case. At one point, it may have had a much more traditionally rocky surface—and then something happened, a crash (or possibly several crashes) with something very large. Those crashes were so traumatic, researchers theorize, that all that was left was the hot core, which cooled into the metal-iron world there today. Going there wouldn’t just be a chance to visit a strange iron world, it could also be a chance to learn more about cores. You read that right. Researchers have long suspected that Psyche is a giant, metallic space magnet. If the core did indeed solidify outwards, researchers say that the kinds of magnetization we see sometimes on a much smaller level in meteorites could be echoed on a larger scale on Psyche as a whole.